Click the button below to add the Canyon 35 Quart Cooler - Outfitter Series to your wish list. Adventure Longer And Stay Cooler With Canyon Coolers. The newly designed Canyon Outfitter Series ice chests coolers are one of 'The Best Coolers For The Money' and will certainly meet or exceed your expectations by a long shot. The Canyon's can hold ice up-to 20 days even in the most extreme conditions. Canyon coolers are even used by the Professional Guides in the mighty Grand Canyon...hence the name Canyon coolers. Serious Ice Chest Coolers For Serious Adventures! If you're sick of cheap plastic coolers that break easily and don't hold ice, the Canyon is a great choice. For the money you can't beat the quality and sleek design features. It's optimized for road trips, truck beds, medical use, camping, and 4x4 use. The more squared up dimensions mean easier packing and moving around. The 35 Canyon Outfitter has non-marking skid plates, completely recessed hinges, latches, and handles which mean 'No Hangups'. A single cable lock can lock both the lid and secure the cooler to a stationary object. Our customers love Canyon coolers...and we're confident that you will also. * Beastly Wall Thickness For Maximum Ice Retention Capabilities: Up to 3+"
* Locking Lid: Secure your cooler to keep both wild animals, or party animals out of your Canyon cooler. Superior cold retention is obtained by utilizing premium polyurethane insulation injected under pressure within all wall cavities, the floor and the lid of the cooler. Made of the super durable and unique polyethylene plastic. Canyon has a very sleek design and is ready for any adventure you throw at it. Went on a jeep run to the desert over Memoral Day. Put ice and food in with no cool down and over 80% of the ice lasted for 2 days. Having a drain plug that worked made it easy to drain off the water. We bought the 35 qt which worked great in the back of our 03 TJ. Great cooler. This cooler is everything the raving reviews have stated. Very rugged and strong; latches are sturdy and smooth. Lid shuts tight and easy. Kids can open it without pinching fingers. The recessed design of latches and handles is genius; a feature that is easily undervalued until you pack it in the back of a stuffed SUV. Canyon may be the only super-cooler manufacturer that realizes how critical exterior dimensions are. The Best Cooler service is equally excellent. I had a cosmetic blemish inside of the cooler I purchased, and they replaced it no questions, including return shipping. Very satisfied with the experience. I bought a Canyon Cooler 35qt and received it today. It was just as expected, very nice! Great Service and communication. I would definitely buy from thebestcooler.com again. Thanks Anthony! A very well built and reliable cooler that holds the cold really well. We use a frozen gallon water jug and it remains pretty much frozen over five to seven days. Add a little ice at the bottom and we have the perfect "refrigerator" for our camping experiences. 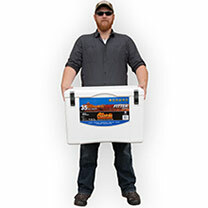 The 35 quart cooler is a great size without being too small or too big, it's just right. Our Canyon cooler goes perfect with our Cricket camper. They claim ice will last 5 days in their coolers, well I got 7 out of two bags of cubes, in fact that was for a party last week and theres still enough to get me through a campout this weekend. Wow! Those are some well built coolers and a lot less expensive than the Yeti and some others in this class so for me this is a best bang for your bucks cooler. If I ever need another cooler it will be a Canyon. Used my new Canyon this past weekend on a fishing trip. I added 2 inches of ice when fedex dropped off the cooler around 2:00 PM in the afternoon. Just to see how it would hold up I left the cooler in my house with the temperature around 77 degrees. Around 5:00 PM we added soft drinks that had been in the frig and sandwiches for our night of fishing. The next morning at 6:00 AM the ice had only slightly melted. I was impressed with the cooler and I love the design of the unit. Already had one friend say he was going to get one to replace his Yeti.